We added this to an old unsightly fence that we had and it took off. Now that old fence is covered by an abundance of grapes! The Wild Grape Vine is a beautiful unique multi-stemmed plant that can sprout into bushes or trees. It is a plant grown in USDA zone 3-10 and can grow up to 17 meters. It has green leaves with pointy tips that are heart shaped at the base. In early summer, small flowers bloom about 10 cm and are later converted to hard green grapes that ripens by late summer. Moreover, the Grape Vine is best developed in heavily-drained, delicate acidic soil that lacks nutrients and is not too rich. It also grows it's best in soils that contain ph levels 5.0-6.0 and can be planted in all locations besides riverbanks. Overall, it can be used to decorate a fence, arbor, wall or ground cover. Wild Grape Vine, like most vines, doesn’t have a trunk. If not regularly maintained it could spread out and quickly overtake other plants. Despite also being called the riverbank grape, it can grow in different locations including along roads, fences, and the woods. Dozens of wild grape species are found naturally worldwide. All species of wild grape vines return every year. Compared to other vines that are native to the United States, wild grapes vines are broader and grow taller than others. Leaves and tendrils grow beside each other but on opposite sides of the stem. Tendrils are small twisted branches that reach out and wrap around limbs to hold the vine in place. Wild grape leaves are very similar to commercially grown grapes. Wild grapes form in triangularly shaped bunches. They can range from black to purple and anywhere in between. Clusters of small, white flowers can be almost 4 inches long. The flowers are both male and female, and insects are essential to help pollinate them to bear fruits. The early summer flowers will give way to grapes that are small, hard and green. The fruit will reach its maturity during the late summer months. Heart-shaped leaves alternate along the stem. They are pointed at the end and have saw-toothed edges. 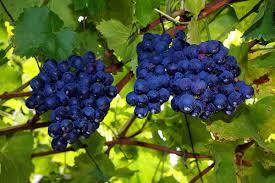 Fruits are edible, but some people believe that the first frost enhances the grapes’ taste. The wild grapes’ small size is perfect for snacking. They can be frozen for later or even squeezed to make fresh grape juice. Even the leaves can be eaten and taste very similar to the grape itself. Wild Grape Vine's leaves are even edible. Vinca Minor Periwinkle - 12-18"